Morgan Godfery has written a long and fascinating review of Moana, Disney's blockbusting excursion into Polynesian history and myth. Godfery talks about how he, like many other Polynesians, grew up hearing two versions of his people's history. The first version, which came from whanau, described the heroic and skilful settlement of the Pacific, and the development of complex cultures on often inhospitable islands. 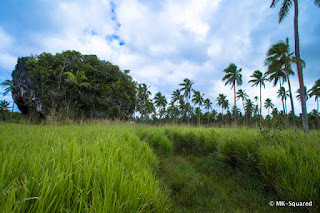 The second version, which was broadcast in classrooms and through televisions and other media, insisted that Polynesians drifted desperately across the Pacific, were wrecked on random islands, and established primitive ways of life that were rendered obsolete by the arrival of Europeans. 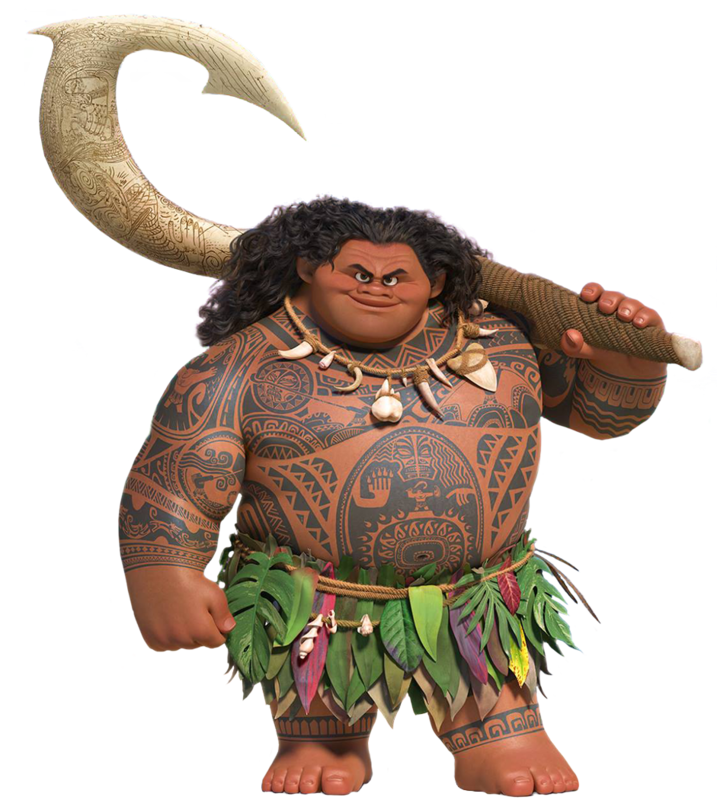 Some reviewers of Moana have praised the film for making its heroes Polynesians, and for showing off Polynesian tattooing and vaka. The film's eponymous protagonist is a sixteen year old girl with an appetite and aptitude for adventure; she has been acclaimed as an 'anti-princess' and therefore a feminist hero. Godfery, though, finds himself unable to join the chorus of praise for Moana. He points out that Moana is an invented character, not a part of Polynesian mythology, and that the supposedly feminist movie debases a real feminist hero of Pacific folklore, the fire goddess Pele, by portraying her as Te Fiti, a wretched 'lava witch'. And like Jenny Salesa, the Tongan New Zealand MP for Manukau East, Morgan Godfery is upset by the depiction of the demigod and hero Maui in Moana. Stories about Maui's strength, cunning, and imagination have been told for many centuries in almost all of Polynesia's thirty or so cultures, from Rapa Nui to Tonga to Tikopia. When tales are told in marae, or beside a campfire, or around a kava bowl, it is Maui who is credited with pulling islands from the sea, with holding up the world, with stealing fire and sharing it with mortals. In Moana, though, the legendary Maui is turned into what Godfery calls 'an American jerk'. Maui is obese, obnoxious, ignorant, a comic sidekick to the film's teenage hero. Last week the kids at my oldest son's kindergarten watched Moana, and loved the film. My son came home from kindy laughing about Maui, and acting out some of his scenes. I didn't want to detract from the kids' enjoyment of the film, but I thought I could broaden their appreciation of Maui by showing some images of the demigod's exploits in Tonga. This morning I put on my tupenu and ta'ovala and headed down to kindy. 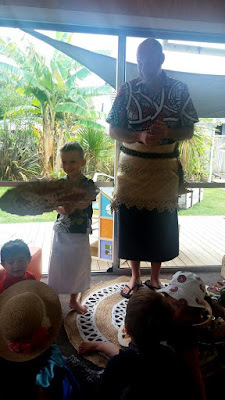 When the kids saw the bulky mat tied around my waist with coconut fibre they were intrigued; one of them decided that I was wearing a 'Maui skirt'. 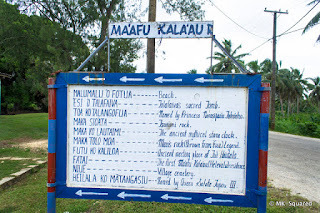 I described how Tongans make ta'ovala by taking the bark off paper mulberry trees, soaking it in the sea, then beating and weaving it, and explained that on formal occasions in Tonga everyone must wear a mat. I showed a series of pictures of sites associated with Maui on a laptop. My son, who was wearing his own tupenu, had visited all of the landmarks, and added his own commentary on them. Even as I talked to my audience of three and four year olds, I realised how much I was simplifying the tangled network of tales that are told about Maui in the Friendly Islands. Some stories, for example, attribute Maui's deeds to a family, rather than the individual I described. Maui fusi-fonua, or Maui the puller of land, brought islands out of the sea; his nephew Maui Kisikisi was the thief of fire. A 1921 article by EEV Collocott introduced English-language readers to some of the Tongan stories about Maui. The Ha'amonga a Maui, or burden of Maui, stands near the ruins of Heketa, Tonga's first capital, in the far east of the island of Tongatapu. Some stories say that Maui, with his prodigous strength, quarried the monument's three slabs of beachrock, dragged them to Heketa, and forced them together. In an essay for the art journal EyeContact I looked at other theories and versions of the Ha'amonga a Maui. Scientists say that the boulder that stands near the village of Kala'au, in the west of Tongatapu, was ripped from coral rock and thrown inland by an immense tsunami about ten thousand years ago. But old stories speak of a giant chicken that was terrorising the island of 'Eua, which lies twenty or so kilometres from Kala'au across a deep and stormy Tongatapu Channel. Maui ran the chicken down and threw it across the water, away from 'Eua. When the bird landed on Tongatapu it turned to stone. 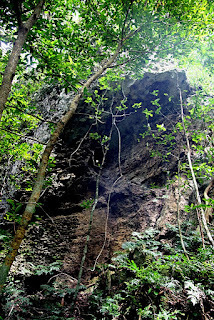 Maui's boulder almost qualifies as a mountain on an island as flat as Tongatapu, and during the wars that divided the island early in the nineteenth century the rock was used as a lookout. 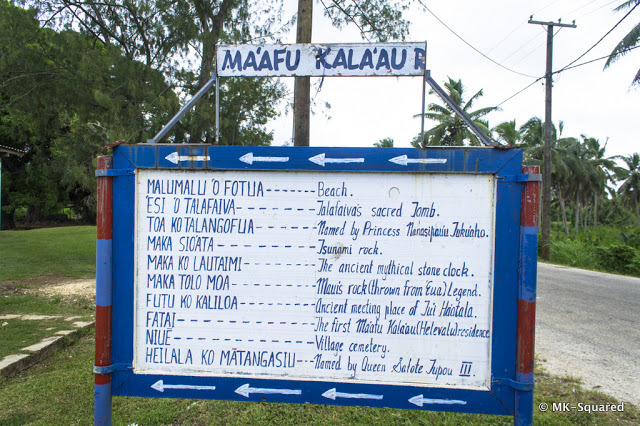 A sign in the middle of Kala'au directs curious palangi to Maui's boulders, and to some of the other historic sites that cluster around the village. It was hard work throwing a giant chicken across the sea, and as he struggled with the bird Maui sunk one of his feet into the porous earth of 'Eua. 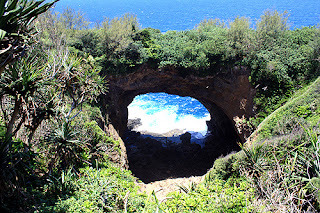 Maui's footprint is a giant sinkhole, and a favourite destination of the hikers who explore the 'Euan highland. 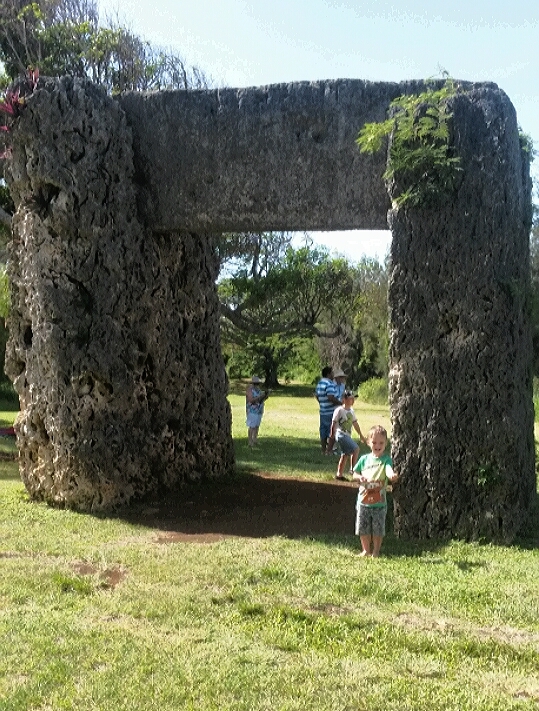 Lianga Huao a Maui, or Maui's archway, is found at the southern end of 'Eua, and is considered a monument to the demigod's mischievousness. After his mother forced him out of bed and into his kava plantation, and gave him a stick to dig with, Maui rebelled. He stamped his foot; the ground shook. His exasperated mother, who had as much strength as her son, grabbed the digging stick and threw it away: it stuck into a cliff. When Maui pulled the tool free, it left a hole that tourists like to photograph. My oldest son's classmates seemed to enjoy seeing Maui's handiwork, and hearing about his feats. I hope that they now find the 'American jerk' of Moana more complicated, and interesting. Well, Ian Campbell's done some solid scholarship, and was by all accounts a good friend of Futa Helu and the 'Atenisi Institute, but if he has that opinion on The Stolen Island then I wonder whether it mightn't reflect a discomfort with the charges that the book lays at the door of New Zealand settler colonialism and New Zealand imperialism in the Pacific. Campbell's essay about the nationalist Mau movement of Samoa seemed to me to seethe with anger at the insinuation of other scholars that New Zealand had played a dark part in Pacific history. But Campbell's entitled to his opinion, and to having that opinion heard and evaluated and considered against the verdicts of other scholars who have an equally thorough knowledge of the Pacific, like 'Okusi Mahina or Atholl Anderson, and also the verdicts of the descendants of the survivors of the raid on 'Ata (and I use verdicts in the plural, because I don't suppose that all of those descendants will have the same opinion on the book). Thank you for sharing the article I am looking for and providing a fairly complete information, I like that ..